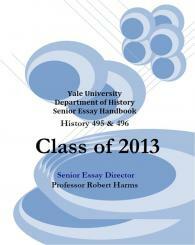 Please read through and review the entire Senior Essay Handbook. The handbook will provide you with due dates and deadlines, important forms, faculty fields of interest, information on prizes, and useful advice and guidelines to help you through the process of writing the senior essay. Also, here are some helpful links for students ready to explore the senior essay, including a list of essay titles from the class of 2012 and examples of prize winning essays below. If you have any questions about the handbook or any of the links here, please direct them to the contacts below.